There are a great number of promising interventions that might have anti-aging benefits, singly and in combination. There is a testing bottleneck, which means that we don’t know what works. By way of contrast, there is a well-documented catalog of life extension interventions in lab worms, but for humans we’re mostly in the dark. To complicate things further, lab worms are clonal populations, while every human is different, and there are growing indications that many if not most medications work for some people and not others. Horvath’s methylation clock is a disruptive technology that could make human testing of longevity interventions ten times faster and 100 times cheaper than it has been in the past. No one is yet doing this kind of testing, but you and I should be advocating vigorously, and volunteering as subjects to help test whatever it is that we are already doing. Given a database like this, multivariate statistical techniques can, in principle, separate the effects of different interventions individually, and also their interactions. The idea is only as good as the Horvath clock. Can we detect differences in aging rate over a time period as short as a year or two? And how sure are we that the Horvath clock really captures the differences that affect aging and long-term health? That’s what next week’s article will be about. The present cost of methylation testing is several hundred dollars, but a funder would only have to put up a fraction of that. The rest would be covered by participants themselves, and Zymo Research, the only company offering commercial testing of methylation age, would offer bulk discounts because they are investing in their future, and because their costs are likely to drop with volume. For several years I’ve been talking to anyone who will listen about the importance of testing. (Here’s a 2015 link, and here’s an update from two months ago.) Aging clocks based on DNA methylation are a disruptive technology which will change the way we screen putative longevity treatments. We now have the potential to learn in a very few years what works and what does not. We have relied on animal tests, biochemical theory, and guesswork because testing in humans has been impractical. Epidemiological studies require treating a very large population and following them over a course of decades. Even very substantial difference is mortality rates can be difficult to detect because the baseline mortality rate is low, because researchers inevitably lose track of some subjects over such long time scales, and because there are so many confounding variables that must be overcome with sheer numbers. Testing of anti-aging interventions in humans has been so expensive and slow that we have been forced to make inferences from animal tests, supplemented by historic (human) data from drugs that happen to have a large user base going back decades. As it turns out, it is much easier to extend lifespan in worms than in mammals, and even the interventions that work in rodents don’t always work in humans. Conversely, there are drugs that work in humans that don’t work in mice—how are we to find them? We know so much more about life extension in C. elegans worms than in people because worms live only a few weeks, are easily cloned, and can be grown by the thousands in standard laboratory conditions. Humans are not so easily controlled, they can’t be genetically engineered or cloned, and their lives can’t be manipulated in the interest of science. It takes decades to document the long-term effects of dietary changes, drugs, supplements and exercise routines, and it generally requires thousands of people to separate the effects of one particular intervention from all the differences in genetics and lifestyle that distinguish human individuals. Just this year, a test is available that is accurate enough to measure anti-aging benefits on short time scales, without waiting for subjects to die. DNAm PhenoAge is a simple blood test developed at the UCLA lab of Steve Horvath. It determines risk of age-related mortality accurate to about 1 year of biological age. Averaging over just a hundred people pinpoints biological age with accuracy of one month. This implies that an anti-aging benefit can be detected with high reliability using a test population of just a few hundred people, followed for two years, tested at the beginning and end of this period. A study that might have required fifteen years and cost hundreds of millions of dollars can now be completed in two years at a cost of less than $1 million. When this new technology is embraced, we will have the means to separate the most effective treatment combinations from a large field of contenders. We have a program in basic science that will eventually lead to understanding of aging at a molecular level. This will suggest molecular interventions that can alter the course of aging. This approach is a sure bet, and it will yield a great deal of interesting science and clinical applications along the way. The drawback is that it is slow. At least several decades will be required to understand aging from the system level down to the molecular level. What can be done to accelerate progress toward substantial anti-aging remedies? You might think that the bottleneck is in ideas. What we need is a disruptive idea. Something like CRISPR or the Yamanaka factors, or maybe some engineered molecule that leaves rapamycin in the dust. I don’t think so. How would we recognize this great idea if we saw it? If it were rather conventional, it’s unlikely it would produce revolutionary results. On the other hand, if the idea were profoundly different and innovative, why would we believe in it without extensive testing? And who would pay for the testing? I believe that testing is really the bottleneck here. We may well have our powerful anti-aging tonic already in hand, and we don’t know it. And if the breakthrough is yet to come, we will need a way to recognize that it works. 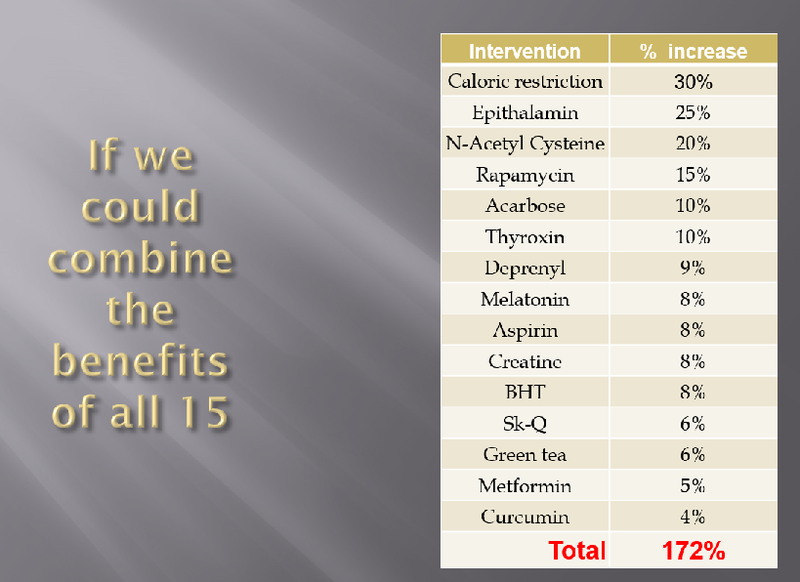 Two years ago, I proposed that the best promise is in combinations of known therapies. The listed interventions all have been shown to extend lifespan in rats or mice. We know what they do individually, but we don’t know how they interact among themselves. In reality, of course, we’ll never see that 172% life extension. Almost all interactions are expected to be redundancy—in other words A and B together are a marginal improvement over either A or B separately. But occasionally, we will discover that A and B synergize. A and B administered together yield life extension greater than the sum of what is available from each of them separately. But there are an enormous number of combinations to test. How are we going to find those combinations that synergize together? It’s not just because humans require a level of care and safety that you don’t worry about in animal tests. It’s the length of the human lifespan. If you’re studying an old drug like metformin or aspirin, then you have a database of people who have used it for decades, and you can look for small differences in their rates of disease or mortality. But suppose you want to try a new remedy, or a new combination of remedies? Typically, you would choose several thousand people as a test group. You need to wait for a substantial number of them to die, so you want to start as late as possible. On the other hand, it’s easier to maintain the health of a younger person than to restore the health of an older person, so you want subjects as young as possible. So perhaps you compromise with an age around 50 or 60. Then you administer the drug or combination of drugs in half the subjects and a placebo in the other half. You follow them for a decade and monitor compliance. How many of them are still taking your placebo 10 years later? Out of a sample of 1,000 sixty-year-olds, you expect 120 of them to die before their 70th birthday. Now suppose you had an intervention that would cut the death rate by 10%, so only 108 of them died. The trouble is that statistically, you can’t tell the difference between 108 and 120. The random fluctuations will overwhelm this difference. How large a sample would you have to start with in order to detect that difference with 95% confidence? For N=6,000 tests + 6,000 controls, you would detect a 10% difference with 95% confidence half the time. If you wanted to be 90% sure that your results would be statistically significant, you would need 15,000 test subjects and 15,000 controls, tracked for 10 years. The cost would be in the hundreds of millions of dollars. Another way to think about the same example: Imagine that the treatment you are testing does not immediately lower the mortality rate, but it slows the rate of aging by 20%. The result is about the same—a 10% lower mortality over 10 years. In New York’s Einstein School of Medicine, Nir Barzilai is organizing the first ever clinical trial of an anti-aging drug. Metformin is the drug he chose, based on lower rates of all-cause mortality, cancer, and Alzheimer’s disease among people who have been prescribed metformin to control diabetes. The risk of Alzheimer’s between age 60 and 80 is about 10%. Data from people taking metformin suggest this could reduce this to 7% [Knowler, 2002]. Barzilai is still trying to fund this study with about $50 million. For that, the TAME study hopes to recruit 3,000 subjects (1500+1500) [Sciencemag 2015]. What is the probability that they will have results significant at the (p<0.05) level? Answer: 83%. You may think that’s pretty good. Or you may be horrified that he could spend $50 million and there’s a 1 in 7 chance that, just because of dumb luck, the trial wouldn’t produce significant results. There’s a footnote in the 83% number: The 31% Alzheimer’s risk reduction comes from a study of younger people, but Barzilai is planning to recruit subjects from 65 to 79 years old because the rate of AD is higher. What’s the alternative? I’m so glad you asked. Suppose we could actually measure aging. We don’t have to wait for someone to die or be diagnosed with dementia. We can do a blood test instead and determine that “this subject has aged 1.5 years” or “this subject has been rejuvenated by 0.5 years”. To reimagine the TAME protocol with an aging clock, we need to add an assumption about what the effect of metformin might be on the Horvath clock (or successor). From reduction in mortality combined with an actuarial table, we might infer an age setback. Lamanna 2010 reports a OR=0.80. Facila 2017 report OR=1.34/2.24=0.60. Bannister 2014 reports OR=0.85 when comparing diabetics on metformin with non-diabetics (yes — metformin in some studies reduces mortality for diabetics lower than it would have been if they didn’t have diabetes in the first place). The logarithmic increase in mortality for a 60-year-old is about 0.075, corresponding to a range for actuarial setback of 2 to 7 years for long-term metformin use. Let’s say the experiment lasts 2 years and after 2 years on metformin, the subjects might have aged only 1¾ years. Very conservative, I think. Compared to 3000 subjects over 10 years, You could get equivalent results from a Horvath clock over 2 years time with 200 subjects. The total cost of the study could be reduced from $50 million to less than $1 million. These probablities are not difficult to compute, but their inputs are very uncertain. We don’t know how much scatter there will be in the difference between two Horvath clock readings when repeated for the same person. I’ve assumed 1.414 years. It coud well be better. We don’t know whether metformin will slow the epigenetic clock, and by how much. It may be that we will get that same 3-months benefit in one year instead of two. Numbers are my thing, and I’m sorry if I’ve left your head spinning. The take-home is that by switching from traditional epidemiological studies of mortality to the Horvath clock, we can get the same information five times faster and 100 times cheaper. For example: Barzilai’s TAME study is projected to cost $50 million, it will take 10 years, and it will teach us the benefits of just one drug. The study I’m proposing will cost less than $10 million and most of this will be covered by Zymo (as discounts) and by subjects themselves. It will take only 2 years, and we will learn about a dozen different interventions and their interactions. Perhaps there many like me that have stuck to a regimen for many years, whose Horvath Clock could at present provide data. Josh, why don’t you look for tracking systems already funded and in place? Like the NIH precision medicine program. They do the primary tracking, and your group of subjects can tack on testing. Talk to NIH and see if they could tag subjects doing the anti-aging part. Frances Collins is very open to citizen input. I am a BOD member of Regenerative Outcomes Foundation, started by Doug Oliver after his vision was restored by stem cells, after 10 years of blindness due to macular degeneration. Doug has changed the world of #RegenMed by working with Congress to include and accelerated approval pathway in the 21st Century Cures Act. All of this should be of interest to anti-aging folks. But scroll down our blog and check out Doug’s interviews with Collins and other policy makes he worked with to make this happen. That sounds like a very promising connection. Do you know anyone at NIH I should contact? time experience of taking metformin extended release version. of health span activist, among the VA patient community. think of this potential. Thanks for all you do! The 10-fold accelerated “space-aging” model could fast-track things, maybe. I have used metformin @ 100mg/da for 12 yrs, selegiline @ 5mg/3per wk, and other supplement for many years; I will volunteer but doubt my history would be acceptable. Very interesting proposal and I am in favor of this 100%. One note though, Type II Diabetics on Metformin following your plan most likely experience a lowering of their A1C blood sugar levels, thus eliminating the need for the drug. I like this idea but aren’t there too many variables. For instance, I take 30 or so supplements along with rapamycin, my own diet plan and exercise regimen , and I’m often changing things around according to something I’ve read. So let’s say in two years I don’t show any epigenetic aging, how will you possibly know which variable or variables were responsible for it? With one person only, obviously we couldn’t know. But with more people than there are combinations of supplements, the analysis becomes possible in principle. There are statistical techniques (multivariate regression) for prying apart the different factors, but they break down when there are more than a handful of variables. Were I in charge of data analysis, what I would do would be to start with the handful of people who showed the most age delay, and look for commonalities in their regimens. These combinations then become candidates which I would check against the rest of the database. With luck, there will be some surprises, and we will learn something valuable. There are no guarantees, of course. But if there is some combination of supplements and diet and exercise, for example, that shows dramatic benefit, then it will stick out in the statistical tests. Josh, I suspect like many of your readers I take one or more of the above list of supplements and follow other anti-aging practices as well. As some have noted it is likely our practices are not well enough documented and stable to provide study input. So how could this kind of a group, which is more likely to want to participate, help? By not changing practice for two years and adding some novel input for that time? Or some other way? Thanks. Josh, this is obviously an excellent idea. Coincidentally (or perhaps not) last week I ordered Epimorph’s MyDNAge test (which I believe to be the same as the test you’re referring to). I’ve been multi-day fasting for about five years now, and FWIW I have a full record of every fast I’ve ever done. For the last couple of years this has been regular five day water-only fasts. BTW is there any way of contacting you privately – I can’t find any contact details for you other than this comments system. To update anyone interested, I got my result back a few days ago. I’m 50 chronologically, but 39 per Epimorphy’s test (99th percentile). I obviously don’t know if that’s a direct result of my regular prolonged fasting, but it’s a pretty encouraging data point. I absolutely agree that testing is vital. I generally test bloods a couple of times per year and I do a DNA methylation test once per year. Unfortunately I don’t regard currently available leukocyte telomere length testing as accurate enough or necessarily representative of the body-wide stem cell telomere reserve to use – if this changes I’m will also add in a telomere test. Has anyone done a LifeLength test? I am more than happy to contribute my DNA methylation results to a database. To all those who have been on a regime for some time, it really doesn’t matter if you didn’t do a DNA methylation test beforehand, if your results deviate sufficiently from your chronological age, we will know you are doing something right. From what other posters have said on this blog before, we already know fasting is highly beneficial – but we knew that already. I forgot to say Longecity are planning a small study using their contributing members, measured by DNA Methylation. Look up Longecity and ‘Community Testing of Aging Biomarkers’. Josh – they might be open to sharing this information with you. Thats my case 47 chronological 41 methylation. Josh did you manage to get yourself tested? It is a very interesting proposal. LEF might also offer blood tests to monitoring for potential side effects. I keep a 20-year log of comprehensive blood tests and supplements (the latter less precise, incl. ~250mg metformin since a couple of years) and recently have looked at aging biomarkers to check what I am doing. I realize DNA methylation is considered today a gold standard but, as non-expert, I also keep wondering how much sensitive epigenetics is to environment, lifestyle and interventions changes. I understand epigenetics is relatively stable? (*). Certainly it is a great start, and things needs to move, and as side study we can also compare to biomarkers based estimates of biological age such as aging.ai, Enroth et al. protein profiling (Mark pointed me to this in a previous post), Levine’s work on BAS (Biological Age Score, which also includes functional and other test as pulmonary FEV, systolic blood pressure and CMV-cytomegalovirus presence). I realize SENS has a different approach but confident things will converge one day thanks to the works of so many visionaries! I have also read about regulatory issues in EU for volunteering. To correct: the work of Morgan E. Levine in his paper “Modeling the Rate of Senescence: Can Estimated Biological Age Predict Mortality More Accurately Than Chronological Age?” refers to several methods with the KDM (Klemera and Doubal method, using BAS) producing more reliable predictor of mortality. Great article, Josh. I want to comment on a side note, namely that diabetics on metformin had lower mortality than non-diabetics not on metformin. Unfortunately, the control group – those not on metformin – has a large percentage of overweight, obese, and sedentary people, and a good many of them are prediabetic, maybe as much as 80% according to the studies of Dr. Kraft. Probably many of them would benefit from metformin. I suggest that we need a study that compares metformin use in lean healthy people. This is a very interesting concept and I think a lot of people like myself would be very happy to join such a study. Maybe you could follow the well-known success of the crowd-funding model to obtain both contributors and money. Good luck with pushing this forward. Josh the dataset of this experiment would be quite valuable. There are ways to protect the privacy of those involved in the study too. I mention this just to suggest that you may only need partial funding. Some of the income you earned giving access to insurers and pharma to the de-identified and privacy protected data set could be given back to the people who have most effectively diarised and tested their approaches. Does thyroxine elongate life in rats? I am a behavioral health researcher at UC San Diego. Your study sounds of great interest. We do not have resources to donate at this time, but we can provide fairly low cost research services if this happens (UCSD-HSRC). Please contact me if this is of interest. I don’t think it’s true that low energy expenditure is associated with longer life span. In human studies, people who live longer are most social and getting lots of exercise. The joyous life and the long life are entirely compatible. Epitalamin is slowing metabolism? How have you come to that conclusion? Epithalamin/Epitalon is a Peptide, i.e. a signal molecule, and works accordingly by signaling to receptors at the target side. It is a representative of a large group of similar peptides and with similar behaviours which basically are produced by processing organs like the kidneys, liver etc. These all have shown to be effective in the sense of better health. BTW, caloric reduction has been proven to work NOT by slowing metabolism, but by restricting key nutrients, and consuming the same amount of calories but restricting said key nutrients has shown to be equally effective – at least in our usual suspects, the humble mice. I personally conclude that the “rate of life” theories of aging are somewhat unfounded, and the corresponding strategies of “restricting metabolic rate to prolong life” are overrated. You forgot to add blueberries! it was about the only thing that further extended the lifespan of CR’d mice. Interesting. But these were only IF mice and were already old when treatment began. It would be interesting to see if polyphenols helped mice on lifelong (adult) CR. Finally! An independent confirmation of the 2016 Belmonte study on in vivo partial reprogramming, rejuvenation. Be good to read the full paper and see if they’ve managed to pick apart the signalling required for de-aging from de-differentiation.